- Spotting Cavity Tile, Plate 12 Cavities Porcelain, 12 depressions. - Glazed on top and sides, 115 x 90 mm approx Length x Width. Color-reaction or spot plates, glazed except for bottom surface. For our valued clients, we are providing a high quality range of Spot Plate that meets on client’s demand. We are a top notch supplier of Spotting Plates. Banking on our enriched industry experience, we are able to supply Spot Plate. We are amongst the most reputed names in the industry, offering Spot Plate. 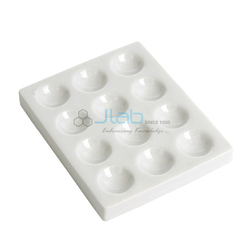 In order to meet excellent quality standards, we are supplying Laboratory Spot Plate. We are a top notch supplier of Cavity Plate. complete porcelain spotting or cavity plates are available in 6 and 12 cavity options. These plates may have minute pinholes which are very difficult to avoid as these are economy range items.